With information growing exponentially and traditional publication channels being supplemented by new technologies, we need to develop our understanding and skills, in order to thrive in this changing information environment. “Information Literacy lies at the core of lifelong learning. It empowers people in all walks of life to seek, evaluate, use and create information effectively to achieve their personal, social, occupational and educational goals”. Producing an effective workforce is essential to the prosperity of any nation and we believe that information literacy is a key attribute for the workplace. In a study of SMEs in the UK<sup>1</sup> for example, it was estimated that employees spend 6.4 hours a week looking for information. 37% of searches are unsuccessful, equating to £3.7 billion in wasted time each year. The evolving information landscape of the digital age means that education must adapt accordingly in order to prepare students to be effective learners and ultimately productive members of society. Curriculum development in Wales increasingly recognises the importance of cross-curricular skills in supporting attainment across subject boundaries. In an educational environment that is committed to encouraging independent learning, it is essential to provide students with the skills to independently find and evaluate information. This empowers the individual and develops the pro-active learning culture that is so fundamental to educational attainment and progression. Access to information has exploded over recent years with an unprecedented impact on society. Increasingly the old adage that “knowledge is power” has been replaced by the new truth that it is access to information which equates to choice and the power to make informed decisions. Consequently those who are excluded from the “information society” are invariably disempowered in aspects of life from the economic to the social. The importance of avoiding this social exclusion is recognised by the Welsh Assembly Government’s Digital Inclusion Framework. It must however be recognised that the skills to navigate the sea of information available are as essential as the physical access. 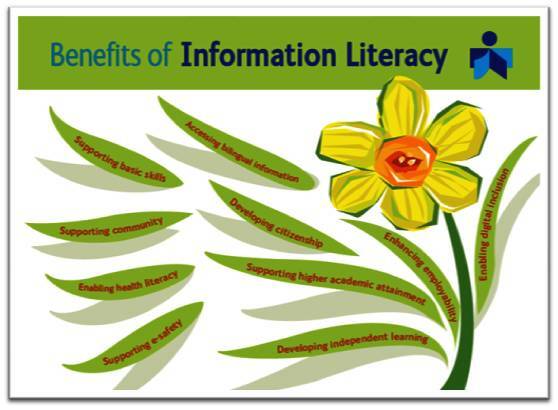 The holistic development of Information Literacy in Wales therefore supports the Digital Inclusion initiative. Information Literacy is becoming increasingly important in a global context due to the factors which are outlined above. This can be seen in UNESCO’s commitment to the “Empowerment of people through information and media literacy”. In October 2009, for example, U.S. President Barack Obama issued a Presidential Proclamation, designating October 2009 Information Literacy Awareness Month.